Time has come to at least listen to some offers on the 11 (mods list and old pix below to be updated as and when). 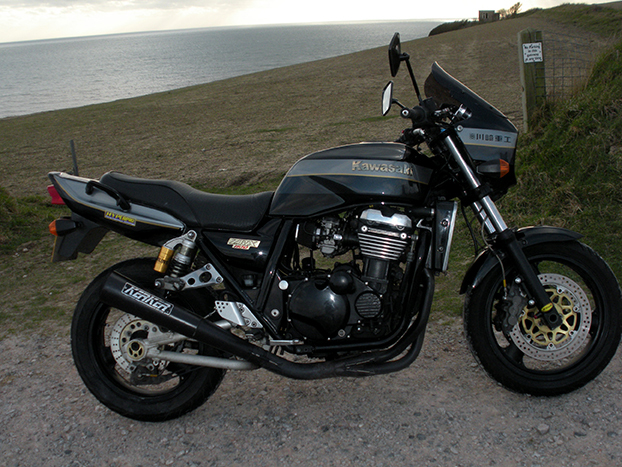 I hate selling bikes, even the iffy ones , and this one has been brilliant. In many years of ownership the only serious problem I encountered was the loss of a pod filter on the M3 which resulted in a holed valve. Still managed potter home on 3, and when it was replaced we stuck the bike back on the dyno and it was making slightly more power than before, 134 at RW. Been two up in all weathers, done a track day, even done (very) gentle off road and not missed a beat. 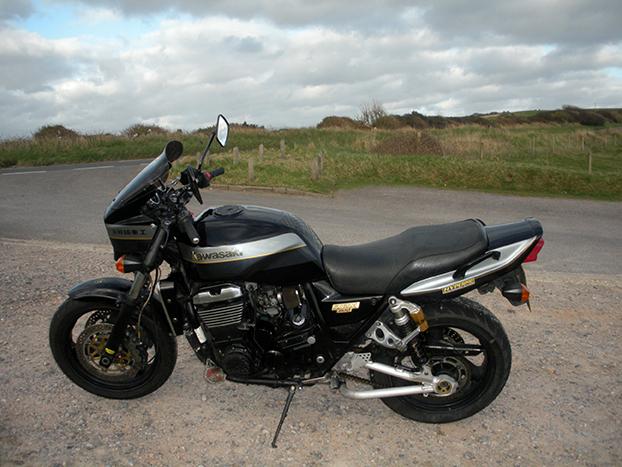 So this is a well used bike with just under 35k miles on the clock, but if I'm buying good use does not put me off. Obviously HPI welcome, lots of paperwork etc etc. MOTOR AND ZORST: ZZR 1100 block cams pistons. Full system original Kerker c/w road and race cans, ironically these days you have to stick the road one on when you go to the track. No problem. Starter chain adjustor (KWIK). K&N pods (plus Ted's battery out kit for all six cans ) Jetted for Kerker and K&N's by PDQ. SUSPENDERS KTECH front fork internals and adjustors top to bottom, Fork Brace (Greg's). Bitubo rear shox. OTHER STUFF Frayed Sanity harness. Lucas ulrea low bars. Has a nicely covered sadle , can't remember where that came from, still have OE saddle with small tear. Somewhere there are miscellaneous OE bits in a box - not including the OE system - which go in with the deal. Steel lines. Oh yeah and bar end mirrors. Have the originals. 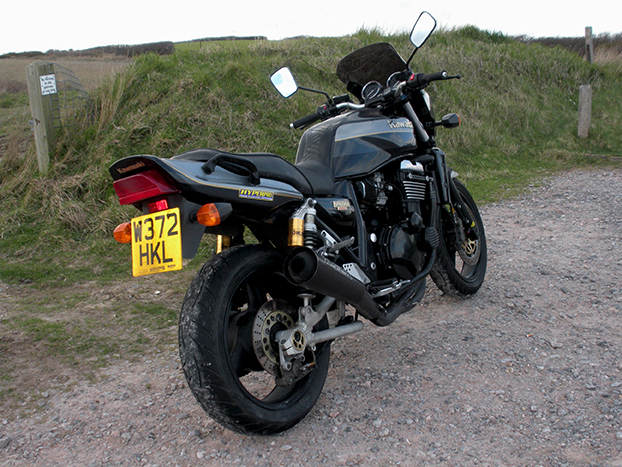 Tyres are the excellent Metzeler 01s with plenty of life, there's an MOT on her until end of June. Cosmetically she's still gets attention but is some way from showroom, like I say I will update pix. But there are no major differences between now and then, ie the tank isn't half stoved in. PS Bitubo not Ohlins these days. Big improvement over the XJRs. Do not sell this for 2.5k to a member here, this place is not what it once was, it will end up on the bay for twice that. But please don't tar us all with the same brush.........anyway I would also have it if I had the cash but alas I am also skint! Does seem too cheap though! As for Pals statement, i dont see Purgerex or lots of bikes and gear sold anywhere else that changed hands here at "good prices" but sadly others have ripped people who were down on their luck or did exactly as he describes so you can only make your own mind up. That said, if you are not selling it as advertised then i would ask why its still on here? No romance in selling for the best price you can get so i would whack it on the bay Nick and then its all done and dusted and you get what you get. Anyway, prices are buoyant at the moment so I'd whack it on EBay. Well, it was indeed exactly as advertised, and if someone had turned up off the board with 2.5k in their hand or transferred the dosh they would have had it, I do play it straight down the line and I think a few people here are aware of that. However, since I posted it I've had a few communiques from OC members, and I take Pal's point on board - after all, he looked it after it for quite a while and literally knows it inside out. Good luck with the sale, I would try to advertise it up this neck of the woods if you can, I have picked up some stupidly cheap bikes around the Exeter area over the years.... people seem reluctant to travel down that way .